Specifically formulated and correctly balanced with the proper amount of protein, fat, carbohydrates, vitamins and chelated minerals, this is a 100% complete and balanced meal for the growth and maintenance of your dog. Prepared with fresh-milled grains, vegetables, and natural oils, and completely free of animal by-products, artificial flavors, colors, preservatives, sweeteners or sugars. 13.2 oz. per can. $3.99 per can, or save 10% when you buy a case of 12 or more for only $3.59 per can! Ingredients: Water Sufficient for Processing, Soybean Meal, Soybean Oil, Brown Rice, Cornmeal, Carrots, Potatoes, Peas, Oatmeal, Wheat Germ, Guar Gum, Dried Yeast, Potassium Chloride, Deflourinated Phosphate, Sunflower Oil, Calcium Ascobate (Ester-C), Calcium Carbonate, Yucca Schidigera Extract, Vitamin A Acetate, Alpha Tocopherols (Source of Vitamin E), Calciferol (Source of Vitamin D2), Thiamine Mononitrate (Vitamin B1), Vitamin B12 Supplement, Riboflavin Supplement (Vitamin B2), Choline Chloride, Inositol, Niacin, Calcium Pantothenate, Biotin, Pyridoxine Hydrochloride (Vitamin B6), Zinc Amino Acid Chelate, Calcium Amino Acid Chelate, Folic Acid, Menadione Sodium Bisulfite Complex (Source of Vitamin K), Manganese Amino Acid Chelate, Copper Amino Acid Chelate, Cobalt Amino Acid Chelate, Sodium Selenite. From Eve Aruguete of los angeles, California on 8/17/2011 . 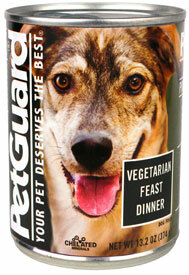 in side by side taste test this won over evolution... and more than organic version of petguard as well. From Anonymous of Niceville, Florida on 5/27/2008 . Both of my girls Love this food! From Colleen of Milwaukee, Wisconsin on 4/23/2008 . I supplement my dog's Evolution dry dog food with with about a quarter can of either PetGuard or the canned Evolution food and she loves it!